There was a time when dog owners wouldn’t think twice about giving their dog the boney leftovers of Sunday’s dinner. In fact, you have probably heard that feeding bones are natural and healthy for dogs. Feeding bones clean teeth and aids in nutrition. That being said, “natural” doesn’t always mean “healthy.” While they do help clean teeth and prevent gum disease, it is generally considered not a safe thing to give your dog a bone. Today’s dog owner is much more knowledgeable about canine nutrition than ever before. With modern knowledge, most veterinarians will agree that bones may not be the most appropriate toy to give your dog. Say you are enjoying a nice dinner and you see your best friend eyeing the bones that were left behind. You may wonder, “Are bones safe for dogs?” The answer to this question really depends on what exactly you are giving your dog. Cooked bones should always be off limits. They can become brittle and easily break into sharp pieces that can do a lot of damage to your dog’s gastrointestinal tracts. It is best to avoid feeding your dog cooked bones, no matter if they are from your kitchen or purchased from a store. Raw bones are generally safer, but they also come with their own considerations. 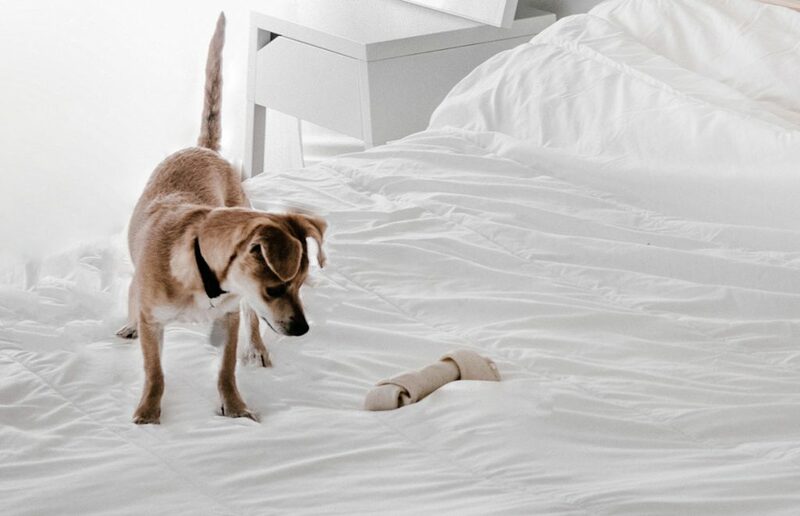 Giving your dog a raw bone provides pental stimulation and helps keep their teeth clean. Choose a raw bone approximately the size of your dog’s head. Then your dog can gnaw away with reduced risk that a piece will break off and be swallowed, which can cause problems. No matter what you give your dog, always monitor them when they are chewing bones. Unchecked access to bones can have disastrous results. These problems can occur in dogs after eating bones, even if they are raw bones. Fractured teeth: Bones may help clean teeth, but they can also break teeth. Bones are hard enough to cause your dog’s teeth to crack. This means a trip to the vet for a root canal or tooth extraction. Oral injuries: Aside from teeth, there are also a few other things to consider. The sharp edges of bones can cut your dog’s gums, tongue, and other mucous membranes. Bones can also get stuck in the mouth between the molars of the lower jar. Airway obstruction: All or part of a bone can slide down the throat and become stuck, blocking airways and causing choking. Gastrointestinal complications: Additionally, if a bone is swallowed, it can damage the digestive tract. Pieces can become lodged in the esophagus, stomach, or intestines. In most cases, emergency surgery is needed to remove the bone. If the bones do not get stuck, they can irritate the GI tract when passing through, causing vomiting, diarrhea, or constipation. In worse cases, fragments can poke through the lining of the esophagus, stomach, intestines, and colon. Food-borne pathogens: With raw bones, in particular, food-borne pathogens, like Salmonella, can be introduced into your household. This risk increases if your bone is left out for a long period of time. This is not only dangerous for your dog, but it is dangerous for any human or animal in your household. It is important to note that any nutrition derived from bones actually comes from the attached soft tissues. The meat, cartilage, fat, and connective tissue are what benefits your dog, not the bones themselves. Bones themselves, however, are a good source of calcium and phosphorous when fed as part of a nutritionally complete diet. However, before feeding your dog a bone, ask your vet to ensure that you offer the proper amount of bone. Source your bones from a respected, local butcher. When you bring it home, meticulously follow food hygiene practices to minimize the chances of food-borne illnesses. When prepared, grind the bones thoroughly before including them into your dog’s meals. If reading about the dangers of bones has you looking for safer alternatives, you have options. There are many ways to satisfy your dog’s instinctive need to chew. Specially made toys, dental chews, and other dog treats are excellent ways to satisfy their need to chew. Toys made of twisted rope fibers or dense rubber are good choices. If dental hygiene is a priority, you can try brushing your dog’s teeth daily or feeding them dental diets, treats, or chews. Talk to your veterinarian about the best options for your dog. Suds N Hugs is focused on providing high-quality service and customer satisfaction. We will do everything that we can to meet your expectations! Check out our in-store products for safe and natural treats for your dog. April 3, 2018 in Dog Care. ← Why Does My Dog Have Spots On Their Tongue?